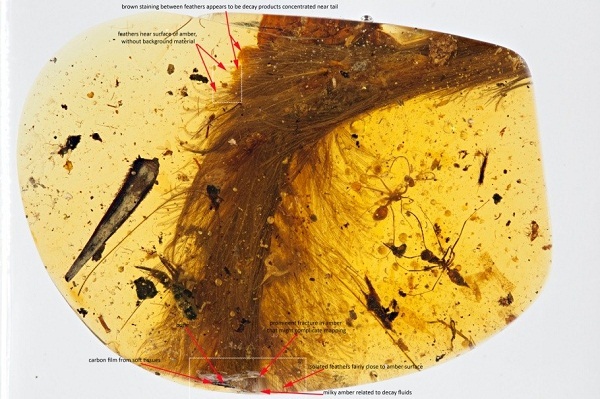 A group of scientists from the Institute of High Energy Physics (IHEP), in collaboration with paleontologists, has discovered for the first time a dinosaur fossil buried in amber. 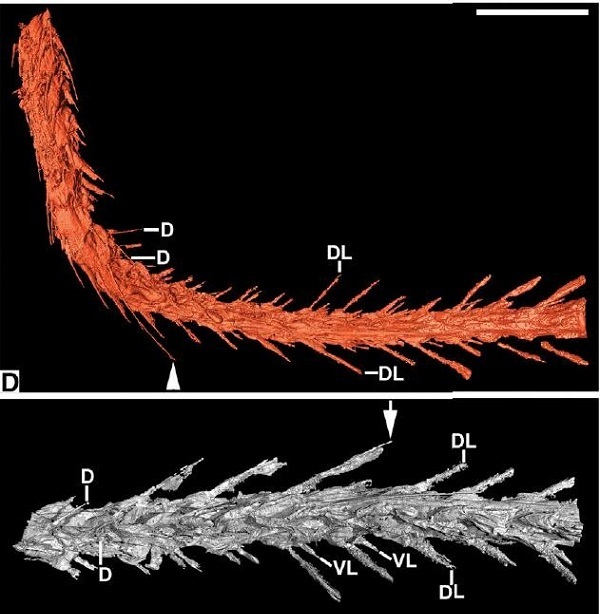 They examined the fossil’s concealed osteological and soft tissue features at the Beijing Synchrotron Radiation Facility (BSRF). Synchrotron light is widely used today to carry out fundamental research in areas as diverse as condensed matter physics, pharmaceutical research and cultural heritage. The fossil was preserved in mid-Cretaceous (~99 Ma) amber from Kachin State, Myanmar. 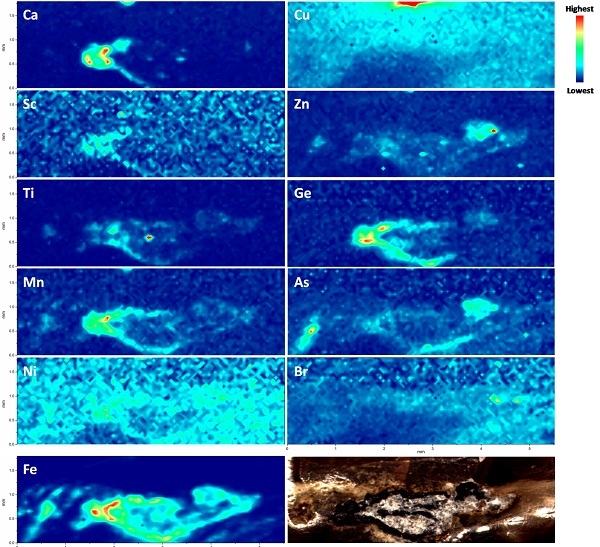 Using synchrotron radiation hard X-ray phase contrast CT at BSRF and SSRF (Shanghai Synchrotron Radiation Facility), the researchers obtained high resolution projected images nondestructively. 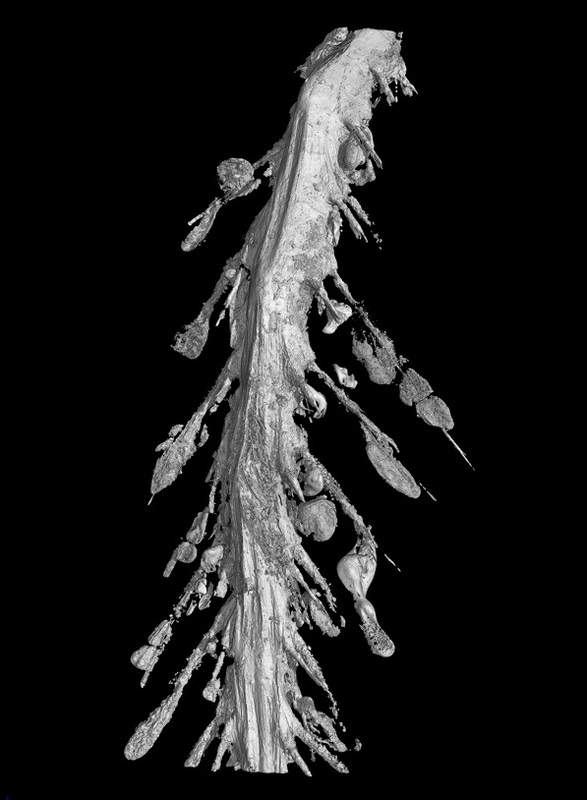 After the tomographic reconstruction, data segmentation, segmented splicing and 3D reconstruction, the team got high-resolution 3D images of the bones surrounded by feathers and amber. The osteological morphology revealed that the fossil is the tail of a putative juvenile coelurosaur. The tail contains at least 9 section coccygeal vertebra. The bone features are similar to those of a typical coelurosaur and significantly different from typical ancient birds. Based on analyses of synchrotron radiation micron-XFI at BSRF, the team obtained the distribution of trace elements in the exposed fossil section. Elements such as Fe, Mn, Ti, Ge and so on appear to be associated with the fossil morphology, and contain a wealth of information about the animal. 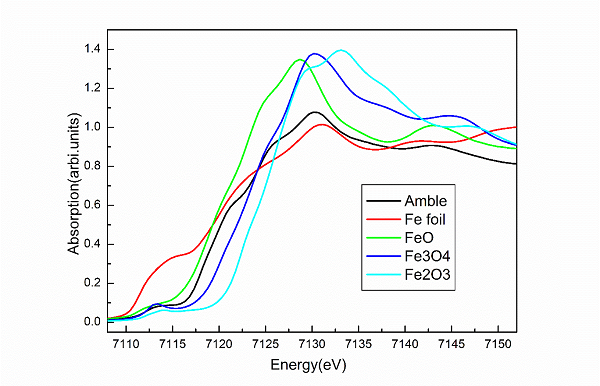 The near-edge absorption spectrum of iron shows that more than 80% of iron in the sample is ferrous (Fe2+), which is similar to hemoglobin and ferritin. These results were published in Current Biology, a well-known biology journal, on December 8. Current Biology is part of the Cell publishing group; its five-year average impact factor is 9.7. The article became one of the top five hot spot articles in Cell publishing group after just one day of publication, with 210 print reports, and over 2000 citations. There were more than 100,000 hits on online articles about the discovery on the day of publication, on websites such as National Geographic (USA), Nut Shell network, and Tencent. There were also hundreds of media reports, including on China Central Television, the Discovery Channel, Proceedings of China, and the Science and Technology Journal. By December 14, the article’s Altmetric index reached 3838, ranked sixth out of the 2.7 million articles published in 2016. The result, published only a few days ago, has become one of the world’s most widely read scientific results of 2016. Altmetric index covers other aspects of the impact of a work, such as how many data and knowledge bases refer to it, article views, downloads, or mentions in social media and news media.